Fact-checkers like PolitiFact and Snopes will pass judgement above search results. Google is taking a stand against dubious and outright 'fake news' by introducing a Fact Check tag in search results. If you ask for information about a highly contested subject, Google will serve a page from a fact-checker site at the top of your results. It's a small breakout box, similar to how Google shows recipes and band discographies. They'll be pulled from publishers like PolitiFact and Snopes, and will show information about the claim, the person who made the claim, and whether they think it's true. "These fact checks are not Google's and presented so people can make more informed judgements," the company said in a blog post. To be recognised as a fact checker, sites will need to meet a rather long set of criteria. That includes using the Schema.org ClaimReview markup on pages where they analyze public statements, or the Share the Facts widget created by Jigsaw and the Duke University Reporters Lab. The content itself must adhere to the Google News General Guidelines, which includes rules about structured data markup, fact-checking, and standards for accountability and transparency. Finally, Google's algorithms need to determine that they are an authoritative source of information. "If a publisher or fact check claim does not meet these standards or honor these policies, we may, at our discretion, ignore that site's markup." To be clear, traditional news stories will be presented as usual. The fact-check box will appear at the top, but underneath you'll find the same publishers and links as before. The new feature, then, won't eliminate the distribution of false and offensive stories through Google. Instead, the company is trying to better educate users about individual sources and the validity of the claims they might be clicking on. Google admits that even the fact-checkers may take a different stance from one another. "Even though differing conclusions may be presented, we think it's still helpful for people to understand the degree of consensus around a particular claim and have clean information on which sources agree," the blog post continues. The roll-out follows a similar fact check system inside Google News. It was introduced at the height of the US presidential election so that readers could better understand when candidates and less-than-trustworthy news outlets were making false accusations. Deemed a success, it was then expanded to France and Germany, as well as the Google News and Weather app in Argentina, Brazil and Mexico. As part of today's announcement, Google said the fact-check tag, which usually appears in the expanded story box inside Google News, will now be available "everywhere." Google and Facebook have both been under fire for their role in the growth and distribution of fake news online. Google has taken steps to identify false and offensive content more efficiently, but the issue prevails. 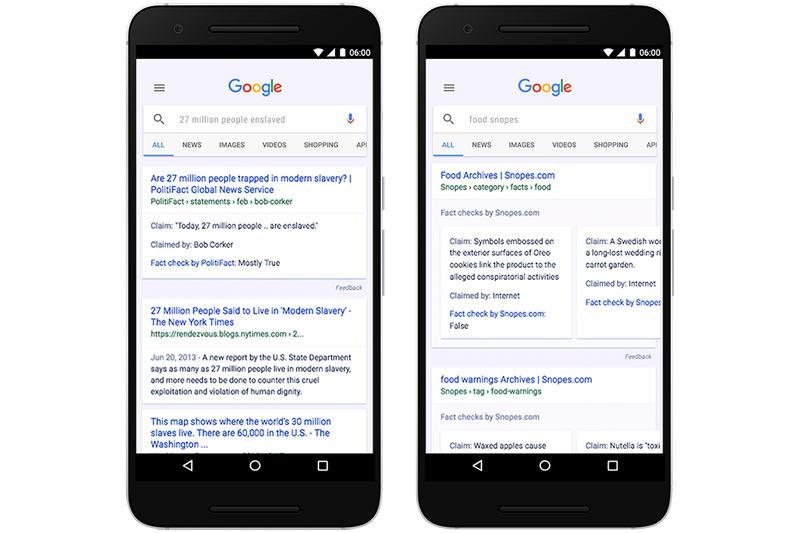 A recent report by The Outline, for instance, shows how often Google's search results can provide misinformation. A parliamentary inquiry by the UK Culture, Media and Sport Committee is now investigating "fake news," and British newspapers have called for a deeper examination of the issue. Google's new solution won't eradicate the problem, but it will serve as a counterargument when critics claim that it's failing to act. "As we make fact checks more visible in Search results, we believe people will have an easier time reviewing and assessing these fact checks, and making their own informed opinions," the company said.